Trip planner source for U.S. and world travel. When Walt Disney brought Mickey Mouse to Anaheim in 1955, he helped establish the city as a major destination. With Disneyland® Park (and, later, Disney California Adventure® Park) as a guide, other kid-friendly attractions followed: Snoopy and pals are a major draw at Knott's Berry Farm, and Soak City U.S.A., Medieval Times Dinner & Tournament, and the Discovery Science Center round out the fun things to do. But there's more to the area than just theme parks and fuzzy, life-size cartoon characters. Situated between Los Angeles and San Diego, Anaheim and surrounding Orange County benefit from year-round, moderate temperatures, which contribute to the enjoyment of several outdoor activities and fun things to do with friends and family. With 42 miles of coastline, Orange County is home to the headquarters of such top-notch surfing brands as Billabong, O'Neill, Op, Pac Sun, Rip Curl and Quiksilver, which testifies to its status as a surfing mecca. Within 30 minutes of Anaheim, you'll find laid-back beach towns with prime fishing conditions off one of the longest piers in the state, gorgeous beaches where you can hang ten or just bury your toes in the sand, a lively, eclectic arts scene, and an elite yacht harbor with plenty of sailing options. An ancient mission, presidential birthplace, renowned art festivals and museums with pieces from ancient tribal art to cutting-edge works by contemporary Californian artists bring sophisticated culture to the area. To millions of visitors who arrive each year, Anaheim means one thing: Disneyland. Families from around the world have made the pilgrimage to the mouse’s house for more than 60 years to encounter imaginary characters and fairy tales brought to life beneath the sunny Southern California sky. For children—and the children of yesteryear who themselves grew up to become parents—Disneyland is more than a theme park. It’s a destination that fulfills childhood dreams and lets moms and dads relive their own childhoods through the eyes of their kids. But Anaheim didn’t start out being so fanciful. German settlers founded the Anaheim colony in 1857. Wine grapes were their first product, but when diseases devastated their vineyards, they turned to other crops, particularly oranges. As more and more people moved to Los Angeles, lured by the mild climate and glamorous lifestyle associated with the emerging movie industry, rail lines and highways were built connecting L.A.’s downtown with outlying communities, spurring development of suburbs in and around Anaheim. Things really took off when Walt Disney opened his first theme park here in 1955, transforming the area into a major tourist destination. 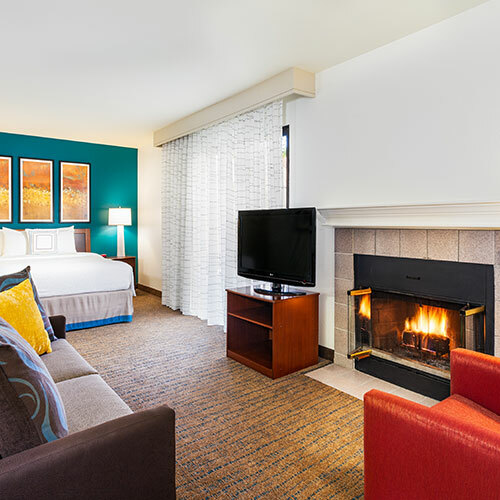 Today Anaheim offers an array of accommodations—from budget motels to luxurious theme park-adjacent lodgings. Most non-Disney properties line busy Harbor Boulevard, Ball Road and Katella Avenue, an area known as the Anaheim Resort District. Familiar brands (Best Western, Howard Johnson, etc.) stand cheek by jowl with family-friendly chain and local restaurants. Some advice: If you're on vacation solely to visit Disneyland® Resort, there's no need to get a rental car for your trip. 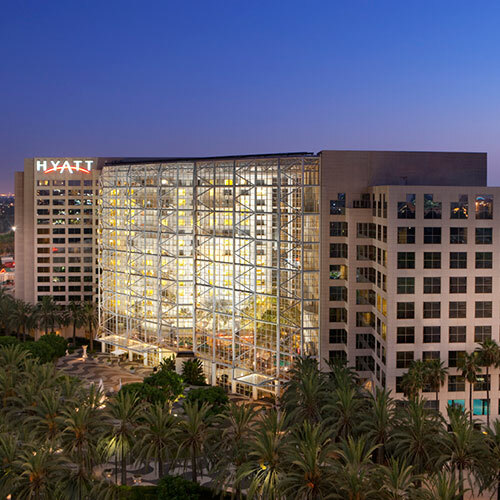 Anaheim Resort Transit (“ART”) is a 22-route bus network linking nearly everything of visitor interest, including the Anaheim Convention Center and Garden Grove's Christ Cathedral. If you want to travel to neighboring cities and O.C. 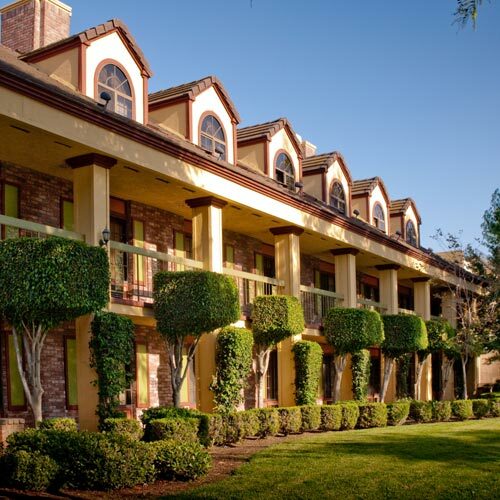 's beaches, Hertz offices are at the Anaheim Marriott Hotel and at 221 W. Katella Ave.; phone (800) 654-3080. Anaheim’s revitalized downtown now boasts modern apartment/condo lofts, a sprinkling of shops, places to eat and Muzeo, a museum and cultural center. Fun places to go are concentrated along Center Street Promenade and in the nearby Anaheim Packing District, where historic buildings enjoy new life as hipster hangouts and gourmet shops. Focus of all the trendy action is Anaheim Packing House, a repurposed citrus packing plant that draws throngs as a bustling food hall where you can savor soul food, ramen noodles or spicy Indian curry. Angel Stadium of Anaheim (home of the Los Angeles Angels) and the Honda Center (home ice for the NHL Ducks) occupy the city's so-called Platinum Triangle along with the eye-catching Anaheim Regional Transportation Intermodal Center (ARTIC). You'll recognize ARTIC, the newest city landmark, by its soaring glass entrance hall beneath an arched roof made of inflated plastic pillows. At night the center glows with hundreds of colored lights. Other Orange County communities offer their own fun things to do just a short drive away. Knott’s Berry Farm arrived on the theme park scene years before Disney in nearby Buena Park, and the Richard Nixon Presidential Library & Museum in Yorba Linda is a must for history buffs. Of course, the O.C. is known for its natural beauty as well, with the area’s first tourists arriving to relax on its incredible beaches. Huntington Beach celebrates California surf culture, claiming the title “Surf City, USA.” Newport Beach has managed to preserve the look and feel of a quaint seaside resort from another century while offering a host of fun things to do with kids. And ritzy Laguna Beach is known for art galleries, beachfront restaurants and a beautiful bluff-top park overlooking the Pacific. Although folks on either side of the Los Angeles-Orange County line talk about an “Orange Curtain,” a physical barrier between the two is as imaginary as Disney’s friendly talking mice. In fact, the two counties are part of the same metro area, and Anaheim is a mere 26 miles from downtown Los Angeles. Visitors can get a taste of a big, glitzy city with its skyscrapers, urban vibe and exciting nightlife, and still easily add on some theme park thrills in Orange County within a single vacation. State and county sales taxes total 7.75 to 8 percent in Anaheim. A lodging tax, called a transient occupancy tax, of 17 percent also is levied along with an 8 percent rental car tax. Anaheim Global Medical Center, (714) 533-6220; Anaheim Regional Medical Center, (714) 774-1450; Kaiser Permanente Orange County - Anaheim Medical Center, (714) 644-2000; St. Joseph Hospital, (714) 633-9111; West Anaheim Medical Center, (714) 827-3000. John Wayne Airport (SNA) in Santa Ana, nearly 13 miles south of Anaheim, is served by major domestic and commuter carriers. Los Angeles International Airport (LAX), approximately 33 miles northwest of Anaheim, is served by international and major domestic carriers. Long Beach Airport (LGB), about 19 miles west of Anaheim, is served by three major domestic airlines. Ontario International Airport (ONT), approximately 33 miles northeast of Anaheim, is served by international and major domestic carriers. Most major car rental agencies serve Anaheim. Hertz, (800) 654-3080, provides discounts to AAA members. Amtrak, (800) 872-7245, departs from Anaheim Regional Transportation Intermodal Center (ARTIC). Amtrak provides daily service north to Los Angeles, Santa Barbara and San Luis Obispo, and south to San Diego. Metrolink is a commuter rail service in Southern California with two stations in Anaheim, Anaheim Canyon Station and ARTIC, (800) 371-5465. Anaheim Resort Transit (ART), (888) 364-2787, is a 22-route bus network to nearly every local point of interest and hotel. Orange County Transportation Authority (OCTA), (714) 636-7433, provides regional service. Greyhound, (800) 231-2222, provides national service. Tres Estrellas de Oro, (323) 588-9188, provides service to Tijuana. Greyhound and Tres Estrellas de Oro buses have a terminal at Anaheim Regional Transportation Intermodal Center (ARTIC), 2626 E. Katella Ave. The base rate is $3.50 at flag drop and $2.75 per mile. Two large companies are California Yellow Cab, (714) 444-4444 and Yellow Cab Co, (714) 999-9999 OR (800) 649-1222. Transportation by bus and commuter rail service is available in Anaheim. Journey to a land of make-believe (actually several lands of make-believe) for a day of family-friendly fun at Disneyland® Park (1313 Harbor Blvd. ), one of California’s top tourist attractions. See ghosts materialize in a haunted house, cruise through a mysterious tropical jungle or encounter singing Caribbean pirates. With more rides, shows and special-effect-filled parades than you can shake your mouse ears at, Disneyland is a truly unforgettable destination. Fly through the skies above famous world landmarks on Soarin' Around the World, one of the premiere rides at Disney California Adventure® Park (1313 Harbor Blvd. ), the other half of Disneyland Resort. The park celebrates the Golden State’s breathtaking scenery in themed lands that include Hollywood Land, Grizzly Peak and Pacific Wharf. Find the perfect Disney souvenir in the Downtown Disney® District (1530 S. Disneyland Dr.), also part of Disneyland Resort. You won’t have to pay to enter, yet you’ll feel like you’re in a theme park with the Disney touch always visible. Shop at the World of Disney superstore, dine at a host of restaurants and for entertainment, there are movie theaters, a bowling alley and the “Star Wars: Secrets of the Empire” virtual reality experience. Marvel at Garden Grove’s Christ Cathedral (13280 Chapman Ave.), a massive, glass-and-steel church that’s been one of the top attractions near Anaheim since its 1980 unveiling. Originally dubbed Crystal Cathedral, the eye-catching structure shines in the California sun thanks to thousands of mirrored glass panes. An equally unconventional stainless steel bell tower soars skyward beside the cathedral. Lose yourself among the art exhibits collected from around the world at the Bowers Museum (2002 N. Main St.), a top attraction near Disneyland in nearby Santa Ana. Pre-Columbian pottery, West African masks, Chinese figurines and paintings by California artists are some of the works displayed within the museum’s Mission-style building. Explore the complicated life and legacy of America’s 37th president at the Richard Nixon Presidential Library and Museum (18001 Yorba Linda Blvd. ), a top attraction near Anaheim in Yorba Linda. Peek into the farmhouse where Nixon was born or snap a selfie in replicas of the White House East Room or Oval Office as they appeared during his administration. Feel the rush as you hurl through twists, turns and sudden drops aboard an intense roller coaster at Knott’s Berry Farm Theme Park (8039 Beach Blvd.) in Buena Park. If you like your rides on the frightening side, this top attraction near Disneyland is the place, but there’s a variety of tamer rides as well as Camp Snoopy, which aims to please little kids. Catch an awesome wave—or just watch the pros—in Huntington Beach, aka “Surf City USA.” The city celebrates California surfing culture at museums and the Surfing Walk of Fame. Feel the sand, sea breeze and sunshine as you stroll along the beach or enjoy fantastic views from the city’s famously long pier. Blow your budget at sprawling South Coast Plaza (3333 Bristol St.) in Costa Mesa. Acres of upscale retailers include Cartier, Gucci, Hermès and Van Cleef & Arpels, to name just a few. Marching from one boutique to another can make a shopper hungry, but have no fear: dozens of restaurants ensure visitors won’t need to go far for a bite to eat. Fall in love with the picturesque ruins of the Great Stone Church at Mission San Juan Capistrano (26801 Ortega Hwy.) in San Juan Capistrano. The beautifully landscaped grounds include fountains, the iconic bell wall and charming adobe buildings more than 200 years old. No wonder swallows travel thousands of miles to return here every year. For fun things to do with kids, Disneyland® Park (1313 Harbor Blvd.) can't be beat. Such classic rides as Peter Pan’s Flight and the Haunted Mansion have enchanted children for decades. In fact, the Magic Kingdom can generate so much excitement that Disney-bound parents have been known to surprise kids at the last minute rather than risk nights of sleepless anticipation. Most shopping centers leave kids antsy and bored, but Downtown Disney® District (1530 S. Disneyland Dr.) isn’t like most shopping centers. Here the “wow!” factor is off the charts thanks to shops like The LEGO Store, home to a fire-breathing LEGO dragon, and Marceline’s Confectionary, a wonderland of old-fashioned candies. Once inside the gigantic tilted metal cube at Santa Ana’s Discovery Cube Orange County (2500 N. Main St.), kids can’t wait to get their hands on all the fun science exhibits. Highlights include a Delta rocket engine suspended from the ceiling, a control room where children can take charge of a space mission and a collection of displays that explore the physics of hockey. Climb into a family-size inflatable raft for a thrilling journey of sudden drops and turns ending in a big splash at Knott’s Soak City U.S.A.-Orange County (8039 Beach Blvd. ), one of Orange County’s great things to do in summer. Younger visitors can frolic safely in Gremmie Lagoon, a colorful water playground with fountains shaped like smiling animals. Of Anaheim’s two Disney parks, Disney California Adventure® Park (1313 Harbor Blvd.) boasts the lion’s share—or mouse’s share—of thrill rides. Scream-inducing rides like Incredicoaster and Guardians of the Galaxy have what it takes to keep teenagers happily terrified, but of course this is Disney, and there are less scary things to do too. Roller coaster fanatics seeking adventurous things to do need look no further than Knott’s Berry Farm Theme Park (8039 Beach Blvd.) in Buena Park. Among the most intense rides is Hangtime, a new coaster that pauses for several nerve-racking seconds at its 150-foot crest before plunging down a track that seems to disappear. Travel back in time to an age when knights on horseback fought with swords and no one ate with knives and forks at Medieval Times Dinner & Tournament (7662 Beach Blvd.) in Buena Park. This dinner show destination invites guests to cheer for their favorite knight as he competes in sword fights and jousts. Just make sure everyone has washed their hands because your meal comes without utensils, just as it would in the 11th century. Embrace America’s national pastime at Angel Stadium of Anaheim (2000 E. Gene Autry Way) and create memories that will last a lifetime. Home of the Los Angeles Angels baseball team, the “Big A” gets an A-plus for fun things to do with kids by including child-focused activities during Family Sundays. If you’re wondering where to eat near Disney, try Oggi's Pizza & Brewery Co . (12362 Chapman Ave.), a place that has gone all-in on its sports theme with TV screens on every wall and pizza choices with names like the World Series and March Madness. Head out to sea for an unforgettable encounter with migrating whales on Captain Dave's Dolphin and Whale Watching Safari (24440 Dana Point Harbor Dr.). Departing from Dana Point, tours get you up-close to dolphins and humpback, fin, gray and blue whales. One catamaran has underwater viewing pods that let you feel like you’re swimming with these amazing animals. Virtually in the shadow of towering theme park rides, Mrs. Knott's Chicken Dinner Restaurant (8039 Beach Blvd.) has been one of the area’s great places to eat for more than 80 years. In fact, the delicious fried chicken dinners were the original draw: Walter Knott built the attractions that became Knott’s Berry Farm to keep guests entertained while they waited for a table. If your trip is going to revolve around the theme parks, Downtown Disney® District will be your go-to shopping destination outside the park gates. Stretching from the Disneyland® Resort/Disney California Adventure® Park entrance plaza toward the Disneyland Resort hotels, the outdoor shopping promenade feels like an extension of the parks; it's meticulously landscaped, spotlessly clean and staffed by helpful employees. If you're looking for fun things to do with the little ones, there's The LEGO Store (you can't miss the LEGO Maleficent dragon perched on the roof), Build-A-Bear Workshop and RIDEMAKERZ, where kids construct their own custom toy cars. If it's Disney merch they seek, the massive World of Disney superstore has it all—from stuffed Plutos to every princess item imaginable. At Disney's Pin Traders, one of the more fun places to go, (next to the Downtown Disney District Monorail station), you can buy and trade collectible Disney pins as well as the popular Vinylmation figures. Near Disneyland Resort, within somewhat reasonable walking distance, is Anaheim GardenWalk, 400 W. Disney Way, where there are plenty of things to do. An open-air dining and shopping complex, it has lovely water fountain gardens, colorful murals that pay homage to Disneyland and Orange County history, and a roster of retailers that ranges from usual mall suspects like Skechers and Red Apparel to affordable, one-of-a-kind clothing boutiques. Next to the Adventure City amusement park is Hobby City, a handful of specialty shops at 1238 S. Beach Blvd. If scale model kits and die-cast racing cars are your passion, Prestige Hobbies is the place; phone (714) 821-8320. Antique hounds should definitely set aside a few hours to travel just outside the Anaheim city limits and explore Old Towne Orange. The City National Grove of Anaheim, 2200 E. Katella Ave., is an intimate concert venue presenting headliners on the order of Bob Dylan and Kenny G as well as lesser musical lights. Looking for laughs? Check the Grove's online calendar; the venue is a regular OC stop for a number of touring comedians; phone (714) 712-2700. If you've scored tickets to see the Angels or Ducks in action, tip back a pre- or post-game cold one and munch on chicken wings at a nearby sports bar. In the shadow of Angel Stadium of Anaheim, across from the Grove venue, The Catch has a full bar and plenty of fun things to do with friends. It features loads of high-definition TVs and a lounge menu that includes a 5-pound, belt-busting patty known as “The O.M.G.” burger; phone (714) 935-0101. JT Schmid's Restaurant & Brewery, across the street from the Honda Center, is another solid bet for suds and high-def sports; phone (714) 634-9200. Sports fanatics can sip a brewskie, nosh and go nuts over the night's big game during a trip to the gargantuan ESPN Zone at Downtown Disney® District; phone (714) 300-3776. Across the way, the Crescent City meets SoCal at Ralph Brennan's Jazz Kitchen, an easy-going New Orleans-themed restaurant and jazz club with live music nightly and exciting things for couples to do. A high-energy, dueling piano show gets the joint jumpin' on Thursday evenings; phone (714) 776-5200. Anaheim GardenWalk (down the street from Disneyland® Resort) is home to some fun nightspots and local restaurants. TMZ ambush artists won't be camping outside Heat Ultra Lounge anytime soon (this is Anaheim, not Hollywood), but this trendy club will at least give you a taste of Tinseltown's velvet rope scene and fun things to do this weekend; phone (714) 776-4328. House of Blues Anaheim books acts ranging in style from indie rock and metal to country and, naturally, blues. This is a good place to see some quality musicians up close; nearly all shows are general admission (no seats). A fun way to kick off a Sunday at the theme parks is with the weekly Gospel Brunch show; phone (714) 778-2583. Family in tow? Treat them to strikes and gutters at GardenWalk's sleek Bowlmor Lanes bowling alley; phone (714) 783-2810. The Phoenix Club, 1340 S. Sanderson Ave., the city's German American cultural center, rolls out the barrel with live big band music for dancing every Thursday evening, and traditional German accordion music on Fridays and Sundays. On nights with no live entertainment, it's still worth going to quaff a German draft beer in the cozy Bierstube pub; phone (714) 563-4166. Walt Disney put Anaheim on the map in 1955 when he chose the city for his new theme park. And where Mickey goes, others will follow. Today, the northern Orange County area is home to a number of kid-friendly attractions centered around the Disneyland® Resort , a AAA GEM attraction. The resort itself encompasses two theme parks, a bustling night spot with plenty of places to eat and three resort hotels. The main draw, of course, is Disneyland® Park , home to Mickey, Minnie and other Disney-inspired characters who reside in the park's eight theme lands. While visiting the park, you can catch a parade in Main Street, U.S.A.; hop aboard a Jungle Cruise in Adventureland; spin yourself into a tizzy on the Mad Tea Party ride in Fantasyland; brave the darkened tracks of the Space Mountain roller coaster in Tomorrowland; explore pirate hideouts on Tom Sawyer's Island in Frontierland; search for “hunny” on The Many Adventures of Winnie the Pooh ride in Critter Country; and call on Mickey and Minnie at their houses in Mickey's Toontown. Allow a second full day to visit Disney California Adventure® Park , another AAA GEM attraction. The 55-acre park highlights the state's best features in its thrill rides and attractions in four theme lands. Holler till you're hoarse on the California Screamin' roller coaster; learn how It's Tough to be a Bug! in a 3-D film filled with special effects; ride Heimlich's Chew Chew Train; and “fly” over California scenes in a simulated hang gliding ride. As to be expected, Disney offers plenty of fun things to do with friends and family. There are plenty of fun places to go off Disney property. Once a family-owned fruit farm, Knott's Berry Farm Theme Park in Buena Park re-creates the Old West in such theme areas as Ghost Town, Fiesta Village, Wild Water Wilderness, Indian Trails and The Boardwalk. Thrill rides abound, and the AAA GEM attraction also has characters: Members of the PEANUTS gang welcome guests in Camp Snoopy, with rides for little tykes. Its partner attraction, Knott's Soak City U.S.A.-Orange County is a great spot for summer fun, with plenty of water rides—a lazy river, tidal pool, tube rides, body slides and the like—to help cool off. Budding scientists will enjoy experimenting at the Discovery Cube Orange County in Santa Ana , which has more than 100 hands-on exhibits that explore science, space, math and technology. Another great place to take the kids is the local zoo. Home to Nacho the bear, mountain lions, a bald eagle and horned owls, the Orange County Zoo in Orange is set in a shaded wilderness park. At night, the diversions only get more entertaining. Head to Medieval Times Dinner & Tournament in Buena Park for a knightly theme dinner show. Seated around a simple dirt ring, guests watch jousting, sword fighting and fancy equestrian moves while noshing on a medieval-style feast. A more modern nightspot awaits at Downtown Disney® District , an entertainment promenade in Anaheim with a movie theater, restaurants and shops (including the largest World of Disney store on the planet, where you'll find nearly anything Walt and friends ever created). If you're looking for history and culture, Orange County has that as well. Begin at the Mission San Juan Capistrano , a AAA GEM attraction in San Juan Capistrano , The 1776 mission was the seventh of its kind established in the state, and its chapel is considered to be the oldest. If you're visiting in the spring, try to time a visit around the annual arrival of the swallows, little birds who have been traveling from Goya, Argentina, to the mission for as long as anyone can remember. The mission receives worldwide attention when they arrive in mid-March to nest at the church. More recent history is celebrated at the Richard Nixon Presidential Library and Museum , a AAA GEM attraction in Yorba Linda. The compound encompasses an enormous museum, 22 high-tech galleries, movie and video theaters, a meticulous garden and the memorial sites of the president and first lady. A special asset to the attraction is the 1912 farmhouse, where Nixon was born. Nixon's father built the home himself on this original site, and the family's furniture and personal effects remain inside. Art collections include Newport Beach's Orange County Museum of Art , which focuses on modern and contemporary art by California artists. Find paintings, sculpture, photography, drawings and prints as well as video and digital art. Historical pieces at the Bowers Museum in Santa Ana encompass Pre-Columbian art from Mexico, Central and South America and works by Native Americans as well as California artists from 1875-1955. Nature lovers will appreciate the Fullerton Arboretum in Fullerton for its gardens. Find desert, woodlands, cultivated and Mediterranean gardens filled with rare plants from around the globe. While on the grounds, stop in for a tour of the refurbished Eastlake Victorian-style Heritage House. And if you prefer fauna to flora, trails traversing the ecological wetlands at Bolsa Chica Conservancy Interpretive Center in Huntington Beach are a good place to spot some 300 different bird species. Inventive structures also attract visitors to this destination. In Costa Mesa the Segerstrom Center for the Arts is prominent for its design. Narrated tours take you behind the scenes as well as explain the center's architecture and history. Another impressive architectural marvel is the contemporary, edifice-like Christ Cathedral , which features thousands of panes of mirrored glass. An impressive sculpture garden surrounds the building, which has an address in Garden Grove . See all the AAA recommended attractions for this destination. Our favorites include some of this destination's best restaurants—from fine dining to simple fare. Located in Downtown Disney® District and a part of the Patina Restaurant group, Catal Restaurant & Uva Bar offers several dining options worth the trip. The Uva Bar is a large, circular, open-air bar offering 40 wines by the glass and such tapas as grilled skewer of chorizo with garlic-roasted potatoes and saffron aioli. The downstairs café offers casual dining, specializing in soups, salads and pastas, while a fine dining restaurant is on the second level. The several fine dining areas exude a more elegant, formal decor. Since the chef uses fresh ingredients and Mediterranean Rim preparation methods, the paella is excellent, as are the boneless braised short ribs, served with a creamy polenta and wild mushrooms. Request a table with a balcony view overlooking the Downtown Disney scene, where there's plenty of things to do this weekend. Steps away from Disney California Adventure® Park , Napa Rose is in Disney's Grand Californian Hotel® & Spa and is one of more enjoyable things for couples to do. Specializing in California Wine Country-inspired cuisine, the restaurant offers more than 60 premium wines by the glass, most from California vineyards. At last count, there were more than 40 sommeliers on staff to assist with wine selections. The restaurant follows the Arts and Crafts-inspired style of the hotel in its use of light-colored woods, 20-foot-high vaulted ceilings, floor-to-ceiling, stained-glass walls and copper and amber glass lights and chandeliers. An exhibition kitchen offers a few counter seats from which you can view the food preparation up close, making it one of the more fun places to go. The inventiveness of the chef is expressed in his Sizzling Beach Rock appetizer—meant to be shared by two, it includes a combination of garlic-seared shrimp, soy-glazed spare ribs and lemongrass chicken cooked on a hot beach stone. Fish is represented in the cashew-crusted ocean trout with heirloom apples and sautéed coastal mushrooms, parsnips and pecans. Available in season, the roast breast of pheasant is served on a ragu of butternut squash, wild mushrooms, parsnip and pecans. Being one of the more indulgent places to eat, there is always a selection of delicious and unusual desserts prepared by the house pastry chef, and a children's menu is available. You won't need to travel all the way to New Orleans for excellent Cajun-Creole food—it's as close as Downtown Disney. Ralph Brennan's Jazz Kitchen mimics the charming architecture that you would expect to find in French Quarter restaurants. The two-story restaurant includes French doors galore and wrought-iron accents, and its downstairs patio and the second story balcony are great locations for people watching. Three food service options include casual dining downstairs, fine dining upstairs and the Creole Café, which serves beignets and coffee from 8 to 10 a.m. Not to be missed is the Gumbo Ya Ya, full of chicken and andouille in a dark, rich roux flavored with Creole seasonings and served with rice. A little milder but still seasoned to perfection is the fried gulf shrimp wrapped in coconut and served with pecan leek rice pilaf and Tabasco pepper jelly sauce. For dessert, bananas Foster is flamed tableside. Entertainment is featured nightly in Flambeaux's jazz club. In the Disneyland® Hotel , Steakhouse 55 boasts a warm and cozy feeling thanks to dark woods and large black-and-white photos of 1950s movie stars. Specializing in certified Angus beef prepared with the chef's specially developed rubs, the restaurant also offers lamb chops, fish, tasty salads prepared with fresh ingredients and side dishes that are large enough to share. See all the AAA Diamond Rated restaurants for this destination. In addition to its many cultural and historic landmarks, this destination hosts a number of outstanding festivals and events throughout the year that offer plenty of fun things to do during your trip. The arts are no stranger to the northern Orange County area. Creative residents of the cozy seaside destination of Laguna Beach have been playing host to the town's annual Festival of Arts since 1932. Held in a 6-acre canyon from late June to late August, the juried art show at this event features works by more than 140 artists. Find paintings, sculpture, pastels, drawings, silk screen paintings, photographs, ceramics, jewelry, etched and stained glass, fiber arts and handcrafted furniture as well as workshops and hands-on demonstrations for ceramics, paper art and painting. The notable show is paired with the Pageant of the Masters . Every evening in an outdoor amphitheater, actors portray well-known artworks. With elaborate costumes, extensive make-up, narration, sets, lighting and a live orchestra providing an original score, actors pose to re-create giant, living interpretations of selected paintings. Another notable area event is the Return of the Swallows Celebration at the Mission San Juan Capistrano , which commemorates the arrival of the swallows to the mission each spring. In mid-March, the little birds converge on the mission, ending their 7,000-mile, 30-day flight from Argentina. After nesting in cone-shaped mud nests cloaking the mission grounds, the birds return to South America for the fall. Observed from as early as the 1900s, the birds are assumed to have begun arriving centuries earlier. The festival that marks their arrival includes docent tours, crafts demonstrations, ethnic food from local restaurants, performances by mariachi bands, local school choirs and Native American dance troupes. California-style sports competitions also are big draws. The American Motorcyclist Association Supercross World Championship arrives in Anaheim in late January. Watch as daredevil dirt bike riders master challenging tracks and perform impressive tricks. Visitors travel from far and wide to attend the Huntington Beach 4th of July Celebration and Parade , said to be the largest of its kind west of the Mississippi River. Following an extensive parade, the 4-day event includes a home decorating contest, pancake breakfast and a 5K run (perhaps to work off the pancakes). The Huntington Beach Concours d'Elegance in early June displays classic cars, motorcycles and vintage bicycles and features entertainment and automobile memorabilia. In mid-August, the city's Huck Finn Fishing Derby encourages kids to dress in costume and bring their fishing poles to compete for prizes for largest fish and best-dressed Huck Finn or Becky Thatcher at Huntington Beach Municipal Pier. If brewskies are more your style, head to Huntington Beach from early September through late October for Oktoberfest , a collection of events celebrating the traditional German festival, including fare from nearby restaurants and local breweries. Dance to German bands, drink, sample sauerkraut and sausages and attend the dachshund races. If you pull on your lederhosen or dirndl skirt, admission is free. However balmy, the holiday season brings two traditional events. From mid- to late December, homeowners on Huntington Beach's surrounding man-made islands go to town with holiday lights, hoping to win the best home or best yacht decor award. The Cruise of Lights Boat Tour is the best way to see the displays of hundreds of homes, docks, decks and boats adorned with twinkle lights and lighted animated figures reflecting off the water. Mission San Juan Capistrano's Christmas at the Mission kicks off with the lighting of the mission Christmas tree and continues with a live nativity, a visit from Santa and crafts in Santa's workshop. See all the AAA recommended events for this destination. One of the most scenic drives in the country, California's Pacific Coast Highway hugs the ocean, riding atop rocky cliffs leading to sandy beaches, through canyons and amid seaside foothills, offering plenty of things to do and see along the route. Rent a convertible if you can, and spend a day exploring the jagged coast along this celebrated, winding route from Laguna Beach to Seal Beach. Beginning in Laguna Beach and heading north toward Seal Beach, the 25-mile trip will take you about 45 minutes if you can resist stopping at every turn-out to take in the scenery and inhale the salty air. The pace is slow, so don't rush it. Instead, pack a picnic to be enjoyed seaside or choose a sandy shore for a stroll alongside the brisk waves. Also, save some time for the excellent local restaurants and fun places to go along the way. The highway bisects sleepy beach towns and passes spectacular scenery as it meanders over sloping hills dotted with colorful wildflowers, around hairpin turns and past steep cliffs. Around every corner are breathtaking, panoramic views of the sea as it rolls onto sandy beaches or crashes against rugged outcrops. An artists' enclave, Laguna Beach is marked by towering headlands and coastal bluffs. After perusing the town's collection of galleries and boutiques, you'll want to hit the highway. Departing Laguna Beach, you'll pass the town of Crystal Cove, home to a coastal state park where you can scuba dive, surf and swim, or hike, mountain bike or ride on horseback through its woodlands. A quick visit is enough time to explore the beach's tide pools and coves, home to all sorts of waterlogged residents. Farther along the route, stop for a game of beach volleyball, some sunbathing or swimming at Corona del Mar's Big Corona State Beach, bordered by cliffs and a rock jetty. You'll know you're approaching Newport Beach when you spot the town's swanky yacht harbor crammed with thousands of high-end craft, its chic shopping district and expansive beach packed with surfers and sunbathers. If you're looking for things for couples to do, consider having lunch here at one of the nearby restaurants, or opt for a gondola tour or harbor cruise. Upon your arrival in Huntington Beach , you can stroll the extra-long pier and watch surfers ride what are said to be the best swells in the state, making it a favorite surf destination among locals. After passing tranquil Sunset Beach and Surfside, you'll arrive in Seal Beach. Home to a naval weapons station and a retirement community and devoid of the barking sea critters that gave the town its name, Seal Beach is a quiet seaside town that operates at a slow pace. While the drive isn't long, it is stunning. Your memory will retain its picture-perfect views: Breaking waves against high cliffs, the sun shimmering off the blue sea, frothy water meeting caramel-colored sands and grassy foothills leading inland. 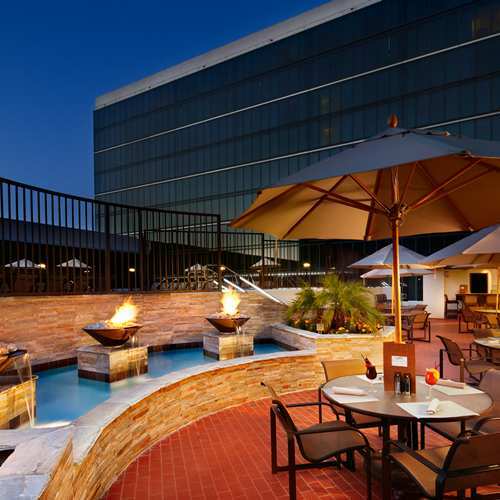 Members save up to 10% and earn World of Hyatt points when booking AAA rates!